It’s 7:25 p.m., and the bar phone at San Francisco’s Bottom of the Hill is ringing off the hook, the line full of fans trying to somehow get last-minute tickets to Elvis Depressedly’s sold-out show. 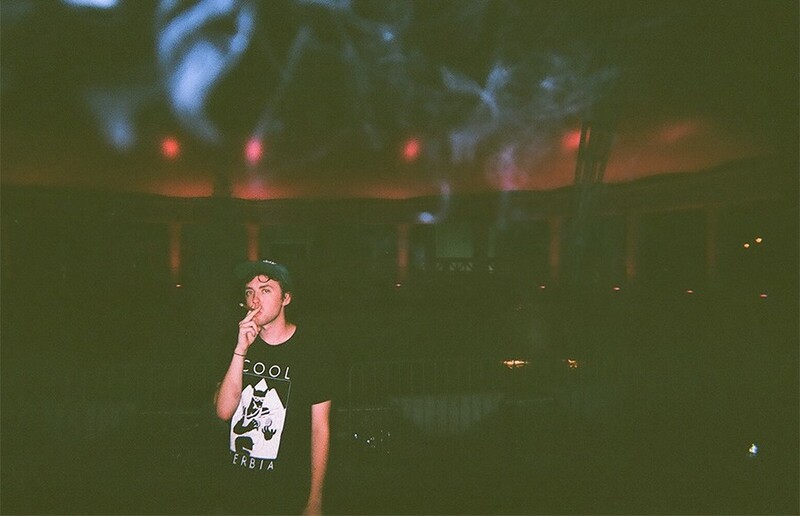 Elvis Depressedly — whose core duo consists of couple Mat Cothran and Delaney Mills — are currently touring in conjunction with the release of their newest record, New Alhambra. Cothran’s never actually been to the old boxing arena in Philadelphia (which closed in 2012) that serves as the album’s namesake, but it’s the concept of days gone by that attracts him most. It seemed as if Cothran cycled through a variety of emotions onstage, too. Sometimes he slammed around, the gold chain he wore swinging across his shirt like a pendulum. At other times, he was motionless, with nothing moving except his mouth and the rush of sentiments pouring out of it. At one point, he turned from the crowd suddenly, showcasing the motto, “don’t trust anybody,” emblazoned on the back of his shirt. Later, in “Pepsi/Coke Suicide” from 2013’s Holo Pleasures, Cothran was exceedingly still and stood quietly with his eyes closed, just breathing. With his head tilted to the sky, he seemed like a man trying to make the most of a moment while he still could. When he played “Caroline Please Kill Me,” a song released under his alternate moniker, Coma Cinema, he was on his knees, looking up, as if praying in between the lo-fi hymns he had sent out to his disciples gathered in the audience. Cothran’s distaste for the music industry machine is nothing if not well documented. Just this Tuesday he tweeted, “music journalism is routinely the most embarrassing writing on earth. Facts seem to only get in the way of over cooked metaphors. so boring.” Despite his distaste, Cothran conceded that he still has a vested interest in making music for the fans who love it. He pauses for a beat, and then cracks a wide smile. “Or until the real Elvis comes back and sues me,” he laughs.